What If? 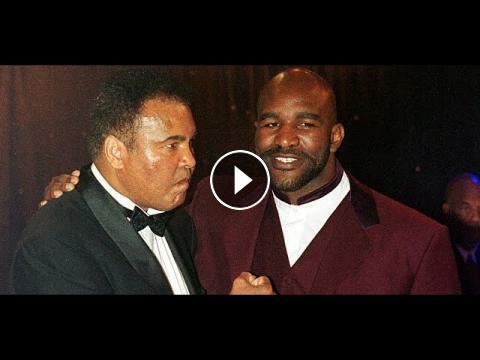 - It is a showdown of two of boxing's all-time great boxers as we look at what if Muhammad Ali (56-5-0, 37 KOs) had met Evander Holyfield (44-10-2, 29 KOs) in the ring? Ali was one of the leading heavyweight boxers of the 20th century, and remains the only three-time lineal heavyweight champion. His records of beating 21 boxers for the world heavyweight title (shared with Joe Louis), as well as winning 14 unified title bouts (shared with former welterweight champion José Napoles), were unbeaten for 35 years. Ali is the only boxer to be named The Ring magazine Fighter of the Year six times. He was ranked the greatest heavyweight boxer of all time by Ring Magazine and The Associated Press. Holyfield reigned as the undisputed champion in both the cruiserweight and heavyweight divisions, being the first and to date only boxer in history to do so, which earned him the nickname of "The Real Deal". Holyfield is the only four-time world heavyweight champion, having held the WBA, WBC, IBF, and lineal titles from 1990 to 1992; the WBA, IBF, and lineal titles again from 1993 to 1994; the WBA title from 1996 to 1999; the IBF title from 1997 to 1999; and the WBA title for a fourth time from 2000 to 2001.
Who better than Frank Lotierzo to look at all the possibilities of a Muhammad Ali vs Evander Holyfield? Evander Holyfield Says Deontay Wilder & Tyson Fury Must Back Up Trash Talk With Action !! Tsitsipas: "I'm Really Please The Way I Fought"